Harters had the most liked content! Amazing isn't it. 'Percy' is the best car I have owned and I have had plenty cars in my time including many 'premium' German brands. 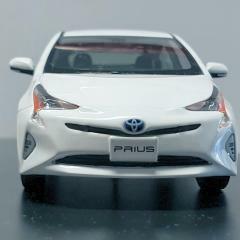 Prius Gen 4 top rated. Yes I am on 17 inch wheels, but I think its definitely the cold that has made them worse. You lucky guy. Maybe when it warms up a bit I can have a look at isolating them, but as the moment its just too cold even in the garage. New Prius coming in March? They have moved the heated seat controls to in front of the cup holders so that an improvement. Unfortunately the Gen 4 does not have auto lock in the UK. I have had that feature in my cars for many years now and I really miss it. Its available in the US and can be configured to lock when driving away or as soon as you put it into drive. Mine is included too. The tape round them at the moment looks OK, but I have put a piece of dense foam between the cover and the wires, just in case as an interim measure before I get my letter. I think the recalls are great too. Much rather know about possible issues that can be corrected rather than wait for something to happen which could cause further issues. I saw this over the Prius Chat and they had a link to a VIN/Reg checker, but it was only for the US. Maybe there will be one available for us here in the UK? I am the opposite, I think they look great on white as you have the black/white contrast which matches with the black/white of the two tone rear bumper and rear three quarter panel. With the fuel figures I am getting with my car on 17s I really don't think you need to worry about fuel efficiency 👍. They also really help with the spray and keeping the side of the car clean. I also chose the chrome back which I initially wasn't so keen on but now I really love it and I am amazed at how many admiring glances I get and that ties in well with the bumper protector.